ABPA members at the annual Car-Part.com industry conference. From left: Jim Smith of JSC Group, Mike Dolabi of National Autobody Parts, Ed Salamy of ABPA, Nick Scheid and Bob Frayer of NSF. The annual Car-Part.com Industry Conference was held August 6-8 at the Holiday Inn in Erlanger, KY, just a stone’s throw away from the Cincinnati airport. Our friends at Car-Part.com, in particular Jeff and Janice Schroder, hosted a great convention that was not only educational, but entertaining. Many ABPA members know the Schroders and Car-Part.com from their participation in recent ABPA conferences, where they typically conduct a breakout session. Since becoming Executive Director two years ago, one of my goals has been to build relationships between the ABPA and other organizations, including recyclers, insurers and the various body shop associations. The purpose of this is multifaceted, but in the case of recyclers we face similar challenges. As many of you know, salvage yards can be big buyers of aftermarket collision parts. Representing the ABPA was myself, Board President Jim Smith, Board member Mike Dolabi and former Board member Nick Scheid. 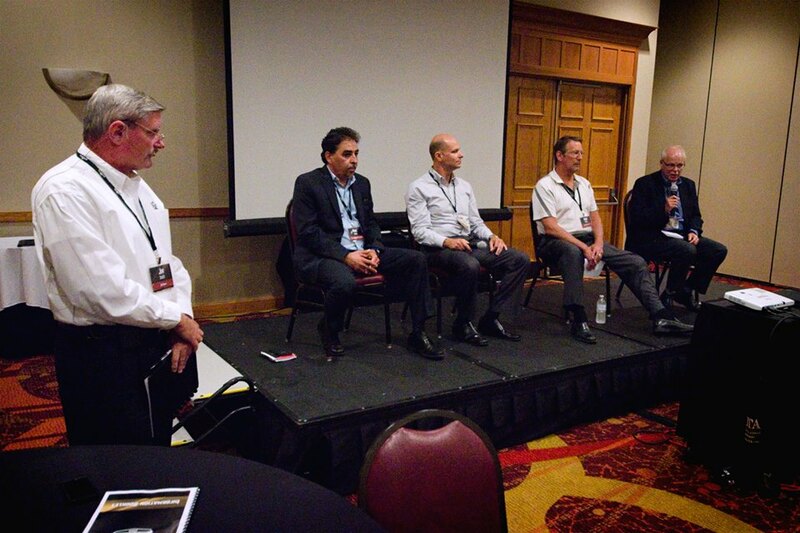 Jim once again hosted a panel discussion to review the aftermarket collision parts landscape. All of the previously mentioned ABPA members participated, along with Bob Frayer of NSF. During the panel discussion, many important topics were discussed including the QPC, ABPA’s lawsuit vs. Ford, NSF certification, GM Dynamic Pricing, and parts manufacturing trends. Although we had less than an hour to review these major topics I felt that the discussion went extremely well, and that we were all able to get our points across. Bob Frayer from NSF also had his own separate presentation where he went into more detail about NSF parts certification, distributor certification, and the new body shop certification program. Of the three hundred plus attendees, most were there for education. Car-Part.com does a great job in having multiple breakout sessions to review not only their product lines, but also to help their customers manage their businesses. A successful conference needs to have some after hours “playtime” as well. This has always been important at the ABPA conference and the Car-Part.com conference is no different. In past years, the Schroders would host a private box at the Cincinnati Reds game. This year, they did something different and held a Riverboat Cruise. Unfortunately, I was not able to participate in this as I had a flight to catch, but all reports indicate the cruise was well attended and well received. I would encourage more of our members to attend next year’s Car-Part.com conference, as it is a great opportunity to meet potential new customers. It is also a tremendous opportunity to build relations with the recyclers and to educate them on the challenges that aftermarket parts manufacturers face.